accepts the connection...It accepts 800 connection without any problem but after that it throws exception saying...."Exception of type 'System.OutOfMemoryException' was thrown. : mscorlib : 0"
happens if single client continuously connects & disconnects at an interval of 3 sec. After 2 hrs. it throws same exeption. are you closing teh socket when client discoonnects? the error System.OutOfMemoryException means exactly what it says. so check if you create/open any files and not disposing them (like client information, hashtables, datareaders and so on). are you synclock the stream? check the stack trace of the exception. sometimes it tells you where exactlly it hangs up. Thanks GeekByChoiCe for ur quick response. As soon as clients disconnects socket is closed carefully. I had checked all the objects are property disposed through .NET Memory profiler. Also had used monitor.enter & monitor.exit wherever needed. Also when single client gets connected & disconnected continuously Socket application memory in task manager shows MemoryUsage (14MB) & VM Size 37MB. It keeps increasing decreasing as client connects/disconnects. could you paste the stack trace of your exception? right now its hard to tell whats wrong without any source code. so just fishing in the blue. i honestly have no idea if the creating of threads are limited either. wouldnt it be better to create a new class for each client instead of a new thread? Post your socket code here. You should never create more than 20 threads at the absolute maximum, but even that is a little insane unless you have a serious application. You should probably be using an asynchronous model for communications here instead of threads. .ZIP your project with the client+server so we can compile+run+duplicate the issue you're seeing. I am facing same problem with socket application like Kamlesh_sj08. I am trying for long time. But I not get a positive result. I am writing a program for tollgate that have taken readed card. So my purpose is : read card than to allow the passage of a toll gate. I have 8 connections. First all connections connects successfully. My application work fine. (the passage of toll gate is ok) After few time (not certain time) I take this exepcition. 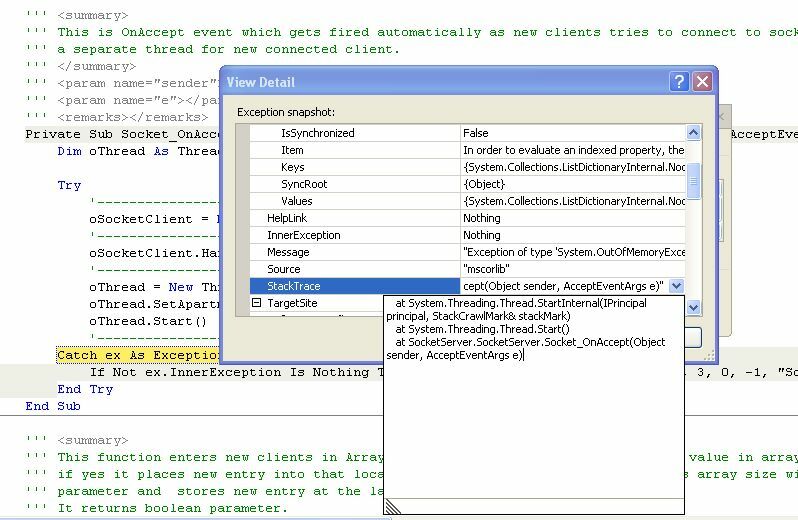 "Exception of type 'System.OutOfMemoryException' was thrown. : mscorlib : 0"
All connections is failed and my application not work again.. I am using using System.Net,system.Net.sockets namespaces. So i wrote like connectToserver,Waitfordata, ondatareceived methods.